Twenty years ago, communist regimes collapsed one after the other like dominoes across Central and Eastern Europe. The last one to fall, in a bloody revolution, was Romania's dictator Nicolae Ceausescu. But communism has left a poisonous legacy in the vast archives of the secret police, the dreaded Securitate. Inside a sprawling military compound at Popesti-Leordeni, on the outskirts of the Romanian capital Bucharest, grey metal shelves are stacked with bulging grey files. 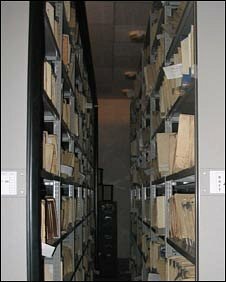 There are more than two million files on 20km (12.4 miles) of shelves. Germina Nagat calls it "an evil library". 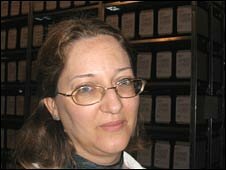 As the chief investigator for the National Council for the Study of the Securitate Archives (CNSAS), Mrs Nagat spends a lot of time poring over the files. "You can find anything," she says. "It's a story of human guilt, human weakness, sometimes courage." What Ioana Voicu Arnautoiu has found here is an incredible story of defiance. A concert violinist, she was born in a cave in the Carpathian mountains. Her parents were partisans, part of a small desperate band that resisted the communist takeover in the 1950s. They held out for nine years - surviving sometimes on boiled bark - before the Securitate hunted them down. Now it is the Securitate's own records that are revealing Ioana's family history, in 85 thick files and a collection of black-and-white photographs. One shows her mother climbing out of the cave and going down a ladder, carrying baby Ioana under one arm like a doll. Before her father was executed, the Securitate took a last photograph of his gaunt face, with dark, haunted eyes. Her mother died later in prison. Ioana was spared. Aged two, she was taken to an orphanage and adopted by a loving family. She grew up without knowing who she really was - until Communism fell and the archives opened. Her story might be unbelievable - if the Securitate had not archived everything so thoroughly. What in some ways is even more unbelievable is the extensive records on those who did not actively resist. Almost anything could be a reason for opening a file, Germina Nagat explained: "Persons who had relatives abroad; persons who used to tell jokes; persons interested in studying foreign languages." By the 1980s, about one in 30 Romanians was a Securitate informer, including 10-year old children. Some did it out of conviction, some were blackmailed. Most were offered something - a rare opportunity to travel abroad or better career prospects. Like so many Romanians, I too had a file. In 1983, a Securitate officer tried to get me to spy on people I knew in exchange for a passport to travel abroad, and cancer drugs for my father. I said no. When I asked to see that file five years ago, I was told it could not be found. But the bulk of the archives was only transferred to the CNSAS before Romania joined the European Union in 2007. And recently, my file also surfaced. It was with some trepidation that I went to the CNSAS headquarters to read it. The first surprise was that it came not in one, but two volumes. And it started much earlier than I thought - roughly at the time I became a student of English and Spanish at Bucharest University. If Ceausescu rose up from the grave, he would put a bullet through his own head! In one report, dated April 1983, a Securitate captain wrote that I refused to sign a written pledge to inform. The next page, marked "Strictly Secret" was signed by his superior. It is a list of measures to be taken for my surveillance, including bugging my phone calls and intercepting my letters. I suddenly recognise my father's minute handwriting in a letter to a friend abroad that I never knew he had sent. It was duly photocopied, together with both sides of the envelope. The file contains many of my own letters. Some passages were underlined in blue or red pen by the Securitate. The second volume is more of a shock. It contains 138 pages with transcriptions of phone-calls, including with my mother and my then-boyfriend. What we mostly talked about was my father's illness and his impending death. All those conversations replay in my mind, as I go through dozens and dozens of transcriptions, all written in longhand by what appears to be a whole army of Securitate scribes. The file ends in December 1985, several months after I had been allowed to leave Romania and just as I started working at the BBC's Romanian Service in London. To see the file at last is liberating, but deeply unsettling. So many strangers photocopied my letters and transcribed my phone calls - and for what? But opening the archives is unsettling for others too. 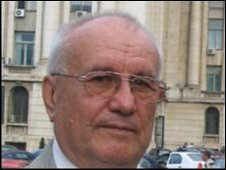 "These files aren't mine or yours, they belong to the state," said Dumitru Burlan, a retired Securitate colonel who was Nicolae Ceausescu's chief bodyguard. "If Ceausescu rose up from the grave, he would put a bullet through his own head!" At the CNSAS, chief investigator Germina Nagat believes that these dark secrets have to be exposed. 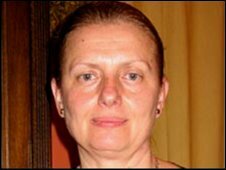 She and her colleagues regularly uncover evidence that some of those who collaborated with the former secret police are now senior judges, politicians and top civil servants. "They have a hidden agenda - resistance to reforms," she said. "To violate the human and civil rights every day, that was their job. And now [they] have to do the reverse! "How can you do this? You cannot be a ballerina after being an elephant!" Romanian courts are dealing with some 700 cases of alleged Securitate collaborators in high places, but so far judges have ruled on only three. There may be many Communist-era elephants out there still trampling on Romania's fledgling democracy. You can hear more in State Secrets, Oana Lungescu's two-part documentary on the BBC World Service, starting on 10 December. Where is the Wall now?